It’s easy to forget that feminism didn’t just magically appear in the late ‘60s with the advent of the Women’s Liberation Movement, nor did feminism’s roots flourish only in the United States. Norwegian playwright Henrik Ibsen’s classic A Doll’s House caused quite a stir following its 1879 premier in Denmark, and it has graced stages around the world for the past 140 years. HART Theatre’s current production, while by no means flawless, still provides a fitting and thought-provoking tribute to this remarkable work. Director Tanner Morton eschews a common trend to update and adapt the script and staging to appeal to modern audiences; the result is a show that initially feels somewhat stilted and dated, but that evolves neatly into the timelessness of its themes as the characters develop. The story begins on Christmas Eve in the comfortable home of Nora and Torvald Helmer. Torvald has just been promoted to bank manager, and Nora is delighted to have been able to buy gifts for the family after years of penny pinching, but Torvald still scolds her for her spending – his patronizing tone makes it clear that he sees his wife as an adorable but sometimes naughty child who needs constant supervision. As we observe Nora’s relationships with her husband, an old schoolmate, a family friend, her children, and the nanny, we get a troubling picture of what seems to be an utterly self-absorbed, devious, charming but immature woman with a tenuous grasp on reality. However, her interaction with the somewhat sinister Nils Krogstad, a bank employee, introduces an entirely different picture – and the Nora who emerges by the end of Act III is a much more nuanced, fully realized woman who has finally found the courage to take the reins of her own life. No longer willing to live the existence of a doll in a doll’s house, she realizes that she cannot be of any value to herself or those around her unless she first establishes complete autonomy. Nicole Rayner’s performance as Nora is the driving force behind the whole production, and she does a spectacular job of moving us through a complex story and character arc. She fully commits to Nora’s silly, almost infantile behavior and leads us believably along the path to her powerful, ultimate declaration of independence. As Torvald, Jeff Ekdahl creates an utterly disturbing husband who shifts smoothly between his indulgent, condescending, authoritarian, and passionate moods – we cannot really like him, but still empathize with his confusion and panic in the final scene when he realizes that everything he believes about marital relations is being upended by Nora’s awakening. Travis Schlegel (as family friend Dr. Rank), Kira Smolev (as schoolmate Kristine Linde), Rebecca Rowland Hines (as the nanny) and Tyson Redifer (as bank employee Nils Krogstad) serve as effective foils, allowing different aspects of Nora’s personality to emerge through her relationships with each. William Crawford’s set design is especially effective – clean, uncluttered, but with enough touches to clearly establish the Helmers’ relatively prosperous lifestyle (and to indicate what Nora stands to lose in the final scene), and Holly Popkin and Kira Smolev’s costumes gave the piece a nice period feel. The show does have some problems – opening night there were glitches with both lights and sound, and a few characters needed some extra work on their lines. It’s also a bit long, with three acts and two intermissions; despite the length, once I got used to the pacing and dialogue it never seemed to drag. Overall, HART has succeeded in offering a solid community theatre production that deserves equally solid community support. 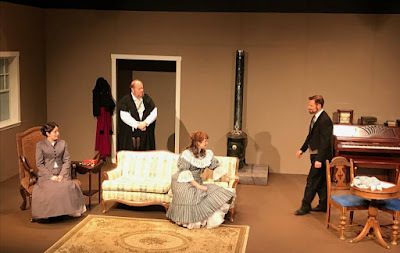 A Doll’s House is playing at the HART Theatre, 185 SE Washington, Hillsboro through Sunday, February 24th, with performances Friday and Saturday at 7:30 p.m. and Sunday at 2:00 p.m.